For a Surrey, B.C. native, Katrina Ward had no problem choosing Wilfrid Laurier University as her school. And the fourth-year health sciences major and women’s soccer goalkeeper saw herself flourish from there. 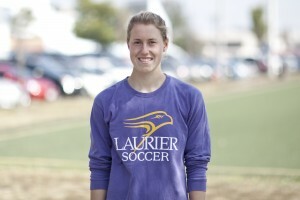 Being part of the Ontario University Athletics (OUA) championship team in her first year in 2010, Ward allowed herself to grow surrounded by experienced players. For Ward, mentality is everything. In her second year, she focused more on experience, learning from older players and getting to where she wanted to be as Laurier’s keeper. But it wasn’t until third year that things really got going for Ward. Ward started eight regular-season contests in 2012, finishing with a record of 5-2-1 before heading into the playoffs. In the OUA quarterfinal against the Guelph Gryphons, Ward made 11 saves and allowed only one goal en route to a 5-1 victory and a berth in the OUA Final Four. From there, Ward was spectacular. The No.6 nationally-ranked Hawks earned an OUA silver medal after defeating the Queen’s Gaels in the semifinal, 1-0. Ward stopped all 12 shots she faced through 120 minutes of action, before coming up big in the six rounds of penalty kicks. She then stopped 17 of 18 shots she faced in a 1-0 extra-time loss to the No.1 Ottawa Gee-Gees. Fast-forward to 2013, Ward continued to excel in the first few games of the OUA season. While Laurier’s record sits at 2-1-1, Ward has only allowed two goals against her in four contests, and was named OUA athlete of the week following her first two shutouts of the season. It’s the first time she’s been given the OUA honour. In her fourth season, Ward mentioned that she has a lot of hopes for both herself and the Hawks.